Billionaire Francis Reboul lived in the biggest private residence in Marseille. Built for Napoleon lll, it had a direct view of the bay. One day, its owner was enjoying this view, when he spotted a huge, dark blue, 300-foot yacht anchored just offshore and apparently taking photographs of his house. Sure enough, the owner, Oleg Vronsky, had been cruising along the Riviera from Cap Ferrat to Saint-Tropez, looking at properties with a view to buying a house here. He fell instantly in love with this one and decided to buy it, at all costs. This book is the story of Vronsky’s decision and Reboul’s desperate attempts to stop him. Peter Mayle has written thirteen books to date, seven of them novels. Many are set in Provence where he has lived for the past twenty years. He knows and loves every aspect of this beautiful corner, especially its cooking!! The book is full of tantalizing menus and recipes. 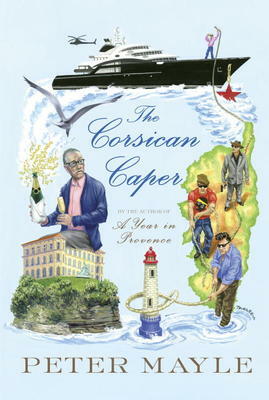 The result is that The Corsican Caper is all about the Riviera jet set and provides a delightful escape book, in spite of the deadly serious plot at the centre of the story.